[tps_footer]The first release of the year 2016 is Amitabh Bachchan, Farhan Akhtar and Aditi Rao Hydari starrer Wazir. The Bejoy Nambiar directorial film which is assumed to be an intense one has finally hit the screens. The much in news film however had minimal promotional activities and the film only made its space in the minds of the audience for its intriguing trailer and a few songs. Wazir was expected to be a critically acclaimed film given its tough and intense genre. The film with an impressive star cast has opened to a poor start at the box office. Wazir has received a 15% opening at the box office, which is a very poor scale given the fact that there are no new major releases since past two weeks. The movie has received a very average response if one compares it with Farhan Akhtar’s other movies like Shaadi Ke Side Effects. 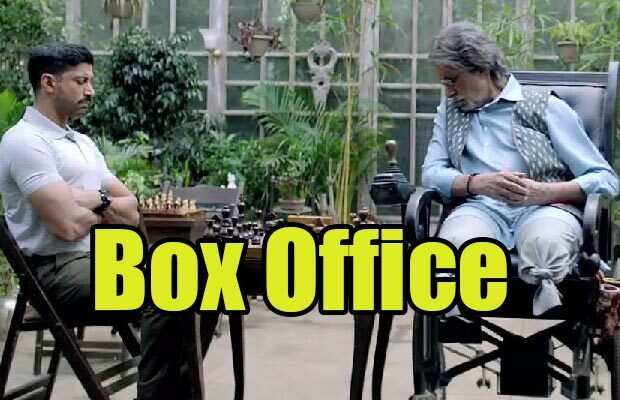 The film Wazir however has a high opening when compared to Piku and Shamitabh. It can be rightly said that Wazir’s collections will now solely depend on mouth publicity. The movie was anyways short of promotional activities which further added to the disadvantage as the audience was not well aware of it. The songs of the film Wazir are also not on the chart busters. Produced by Vidhu Vinod Chopra the film is however, expected to gear up in the upcoming weekend. Moreover, the strong concept and plot can help the film regain its lost popularity with good reviews and word of mouth. Another glitch to the film Wazir is that it cannot be termed as a family entertainer and hence it becomes a film for a niche audience which can further affect its overall collections. Vidhu Vinod Chopra’s English story The Fifth Move finds a Hindi avatar as Wazir. Directed byBejoy Nambiar, this thriller stars Farhan Akhtar as Danish Ali, an ATS officer whose one wrong move turns his happy family and professional life into a nightmare. Danish’s seemingly perfect life falls apart when he risks the lives of his family members to follow a criminal. His shortsightedness in the face of duty – a foolish move, quite honestly, from a man who thus far has not shown any instinct for rash and reckless actions, brings him into contact with Pandit Omkarnath Dhar (Amitabh Bachchan), a handicapped, wheelchair-bound chess teacher nursing his own deep wounds of loss. Over chess lessons, Danish starts healing and forges a strong bond with his mentor Panditji and begins to reconcile with his wife Ruhana (Aditi Rao Hydari). This new friendship and loyalty leads to Danish promising to avenge the death of Panditji’s daughter, allegedly at the hands of a Minister (Manav Kaul). The game of chess – pawns, rooks and ‘wazirs’ – is a metaphor for a bigger plot being played out between victims and perpetrators. The entire thriller and story hinge on a couple of plot twists, which can be seen as clearly as a speeding truck on the wrong side of the road. In spite of being encumbered by a shallow script and convenient screenplay, Nambiar brings in slickness and crafts some impressive action scenes with the cinematography enhancing the dark and doomed atmosphere with the use of shadows. John Abraham and Neil Nitin Mukesh pitch in with brief but effectual cameos, although the rendition of Mukesh’s character is discordant with the rest of the style and look of the film, giving away a crucial intrigue. Aditi Rao Hydari is earnest as the vulnerable, highly feminine and fragileRuhana. Manav Kaul makes the most of a few choice scenes, as the evil politician with a dark past of his own. Akhtar delivers his most nuanced and mature performance till date, becoming the guilt-ridden, shattered father and husband, the dutiful police officer and the loyal friend. Bachchan is accorded some solid dialogues and a complex character that befits his age and experience. His interactions with Akhtar are sharp, crisply edited. These fine performances and stylish crafting hold afloat a spotty, predictable script (Chopra, Abhijat Joshi) that skates on the surface of emotional damage, politics and even friendship. Previous articleBehind The Scenes: Irrfan Khan Shoots For Inferno With Tom Hanks!